Osteotomy is a term used to describe surgical procedures during which bone is divided, or a piece of bone is cut off. In most rhinoplasty procedures, some form of osteotomy is usually required, to move or modify the osseocartilaginous vault, which comprises a major part of the nose. 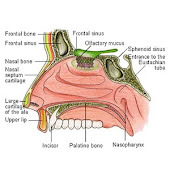 The nasal bone can generally be moved only after it has been carefully cut from the tissue and cartilage around it. This is usually done with the help of sharp chisels, which may be introduced either from the inside of the nose, or through a small incision made at the side. The surgeon performing this procedure needs to possess a high level of skill, to ensure minimal damage to the nasal lining, and reduce post-operative swelling and discomfort. Different types of nasal osteotomies performed are: 1. Paramedian (medial) osteotomy 2. Lateral osteotomy 3.Transverse osteotomy 4. Intermediate osteotomy and 5. Oblique osteotomy. One of the common osteotomic approaches used in nose surgery is the medial osteotomy. During this type of osteotomy, the nasal bone is cut in the middle with a 'back cut'. Then, a small osteotome (bone knife) is positioned along the edge of the bone, and gently tapped to move it along a previously planned path. After the bone is cut, it can be moved, as required. The indications for medial osteotomy are: 1.When mobilization of the entire sidewall is recommended.2. To help prevent uncontrolled or irregular back-fracture from the upper portion of a lateral osteotomy. 3. To widen an overly narrowed bony nasal vault. Lateral osteotomy is used to close a nasal dorsum (open roof) and to narrow or straighten the nasal pyramid. Complications of lateral osteotomy, include: infection, bleeding, massive edema, anosmia, lacrimal duct injury, intracranial injuries, disfigured appearance, narrow airway and nasal obstruction. Note: Lateral osteotomy with infracture can cause the nasal valve angle to be too narrow. Valve angle (nasal breathing) is compromised when it is less then 10 to 15 degrees. An osteotomy between the medial and lateral osteotomies is occasionally indicated. The primary use's of Intermediate osteotomies are:: 1. To narrow the extremely wide nose that has good height (bilateral osteotomy). 2. To correct the deviated nose with one side wall much longer then the other. To correct a deviated nose sequential osteotomies are performed in a fashion similar to opening a book. 3. To correct the abnormally contoured nasal bone that is either excessively convex or concave. Intermediate osteotomies are most effective for decreasing the curvature of an excessively convex nasal bone. The intermediate osteotomy allows recontouring of the nasal bone for correction of the severely deviated bony vault. This osteotomy is performed before the lateral osteotomy. NOTE: This process of breaking the bone and resetting it to narrow the nose is called an infracture. If the nose is being widened after the nasal bones are broken, it is called an outfracture. Note: Straightening and narrowing the upper third of the nose doesn't mean a crooked nose will then be straight. The remaining 2/3rds of the nose (middle and lower sections) if crooked will have to be addressed. This means addressing the upper and lower cartilages (reorientation of the tip cartilages in the latter case) which may be asymmetrical therefore sutures, trimming, or grafts may be used and septal cartilage which may need to be repositioned by detaching it off the nasal floor. There's a difference between simply straightening a deviated septum (septoplasty) by chiseling out the hump &/or protruding side cartilage/bone for improved breathing vs straightening a crooked/twisted or slanted nose (a very challenging & complex task) which extends the length of the nose (septorhinoplasty). I plan on discussing this on a future post.